To celebrate the release of the first two Specialist sets, the Goblin Skirmishers and Dwarven Battalion, we have just released online two bonus adventures (in addition to the two that came in each of these packs) – Goblin Gold and Dwarven Renegades. You can find them in the Approved Adventures section of our website. And despite a visual inspection of the final prototypes before assembly, two of the banners in the upcoming Goblin Marauders set, incorrectly display a Blue mounted bow where they should have displayed Blue long sword banners instead, for use with the Hyena riders. The second mistake is more problematic. We have asked the manufacturer responsible for the error to airship us the correct replacement banners, which we will mail free of charge to anyone that requests them. In the meantime, you can simply use any of the Blue long sword banners that came with your base game, and attach these to your Hyena riders before deployment. The silver lining in this is that it gives you 2 free Blue mounted bow banners – which we recommend you use with caution, if at all -. Ostrich riders should remain green bow units only! We hope you will have fun with these new troops nonetheless, and ask for your understanding as we work to fix these issues. 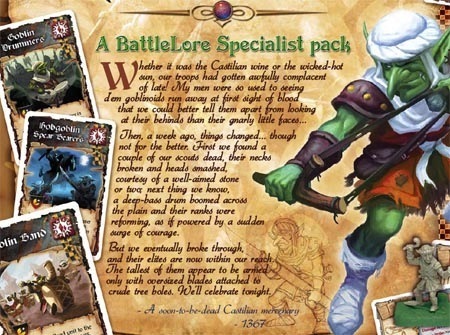 BattleLore Specialist Packs are available for preorder! Specialist Packs invade our webstore! They will be available in two waves : First The Goblin Skirmishers and the Dwarven Battalion are expected to hit our shores around July 16th. They should be followed by The Goblin Marauders and The Hundred Years’ War around August 15th. Origins 2007 (Columbus, OH – July 4 thru 8): Demo versions of the first Specialist packs, the Dwarven Battalion and Goblin Skirmishers sets, will be shown for the first time to the general public. Actual “For Retail” copies will follow soon thereafter and should be shipping by Mid-July. 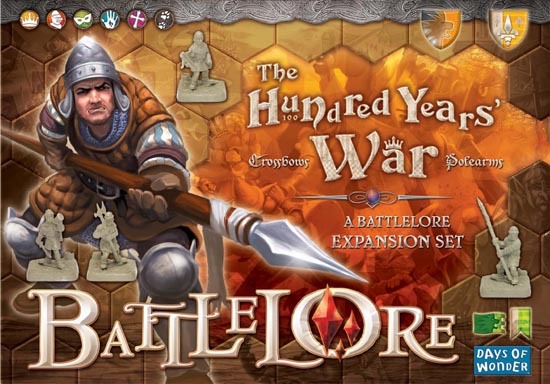 World Boardgame Championship (Lancaster, PA – July 31 thru August 5): Demo versions of the second wave of Specialist packs, the Goblin Marauders and the Hundred Years’ War – Crossbows & Polearms sets, will be previewed for the first time. Gencon 2007 (Indianapolis, IN – August 16 thru 19): With any luck, the 2nd wave of Specialist packs, previewed at the WBC, will become available for sale at this date. In addition, we will be running BattleLore events (demos, tournaments, …) at all of these venues. Details will be posted in the Events section of our web site as we get closer to each show. Throw a few summer vacations in for most of us all, and this blog is likely to see a few less updates than customary during the coming two months. In the meantime, you may want to visit the battleloremaster web site, where Open-the-Box pictures of the first wave of Specialist packs have just started appearing! We wish you all a great summer and hope to see many of you at the shows. The BattleLore War Council, about to retire to its Summer Court. 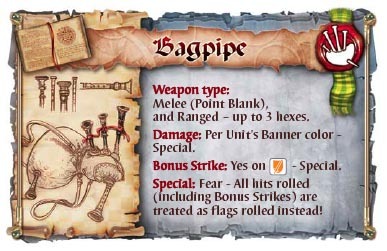 Like many other Dwarves-related contraptions, the bagpipe is a rather peculiar, if somewhat underappreciated, device. 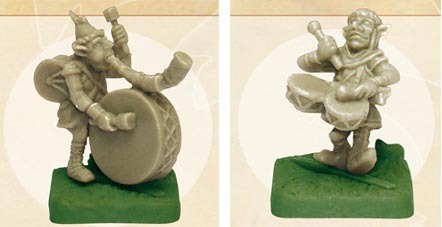 Whereas the thuds and thumps of a Goblin bass drum reverberating over the battlefield warm the heart and spirit of fellow friendly units, the Dwarves’ instrument quite literally does nothing but sow fear in their enemies’ ranks. 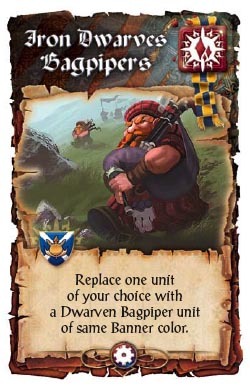 There seems to be as many variations of bagpipes and pipers as there are dwarven units on the battlefield; they come in all colors, leading to interesting choices and trade-offs during deployment. 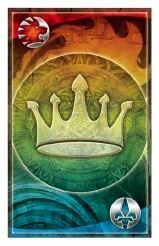 Epic BattleLore, our expansion for fighting epic battles over two boards rather than a single one, is now shipping in the US (and soon in Europe and the rest of the world). The complete Epic rules are now available for download on this page. We have also added two new four-player adventures, Logroño and the Road to Najera, to the list of official adventures. Goblins invent the printing press! A beta version of the software that generates print-quality PDFs and paper output for the adventures created with the Adventure Editor is now available online. To try this new functionality out, simply head out to the Adventures section on the site, click on the adventure you would like to print, and click on the Export PDF… link in the list of options in the upper right corner of your page. A PDF file of the scenario, layed out to almost the same standard as if it had been produced internally by our own graphic studio, will be automatically generated! This is a BETA – so there will be bugs (mostly cosmetic and overflow issues). A sticky thread has been posted to that effect in our forums. One of the benefits that will follow from the introduction of Call to Arms into the game system is the capability it gives us to progressively introduce new, truly specialized, units into the game. This will all start becoming apparent when the first Specialist packs start shipping in late June/early July. finally, this also gives us an additional cool venue to differentiate units further between themselves, based on races, tribes, etc…; in some instances, the Specialist card(s) a unit comes with will turn out to be a key differentiating factor in and of itself indeed. All of which brings us to one of the first truly distinctive unit we will introduce: the Goblin band! 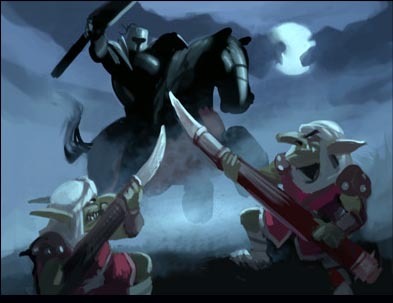 As any Goblin chief will tell you, nothing works better to rally a few fellow tribal units than the beat of a drum on the battlefield. 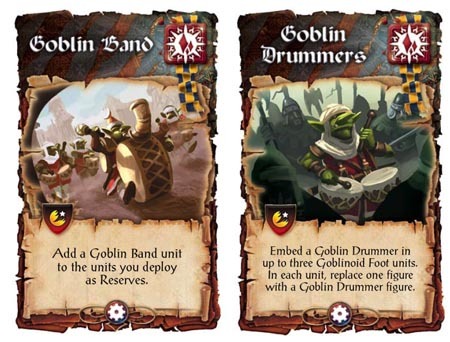 As a complete Goblin band, made of a Goblin band leader and three drummers, the band gives a widespread Support presence (half of the support that is required for a unit to be fully supported, hence Bold) to all friendly units within the same Section of the board. But as individual drummers, embedded in existing Goblinoid troops on foot, each drummer makes the troop he joined Bold. Next blog entry: A Surprise (with any luck)! Six months into the launch of BattleLore, we think it might be worthwhile to step back and share with you a bit more of where we’re heading, from both a game system and background story perspective. But a recent, courteous discussion on the subject on BattleLoreMaster.com‘s fan site; a number of threads on our own forum; and a well thought-through, eloquently written review on Boardgamegeek (English only, sorry!) of how BattleLore stacks up against Warhammer convinced us of the benefits of sharing a bit more with you all, even if only in this post ;-)! For the bulk of this year, our priority will continue to be on publishing supplements that are core to the Game system, even if at the expense of further developing the game’s universe and BattleLore’s yet little-discussed uchronia. This very genericity makes writing background stories a fairly artificial exercise, compounded by the historical period at hand of which few authoritative texts have survived. 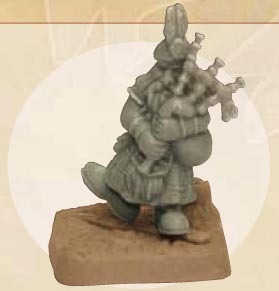 As we progressively introduce new units to the game, starting with the Goblin Skirmisher and Dwarven Battalion set, and rapidly following with a 100 Years War set, another still-under-wraps Goblins Specialist set and, a bit further down the road, a larger yet-to-be-announced set, the situation will progressively improve. As will become evident once these Specialist sets start shipping, the Specialist mechanics introduced in Call to Arms are one of the keys to being able to field differentiated units, to add flavor to various races without further increasing rules complexity or heading down the path of unwieldy unit summary tables. Even once we have all of this is behind us, there remains one key element we wish to introduce soon: Heroes. A good story is often only as memorable as the heroes it features; even more so in the realm of fantasy. What would the Middle-earth be without characters such as Sauron, Gandalf, Bilbo or Sam? What would Melniboné be without Elric, or Midkemia without Pug? For this reason, Richard and our team are hard at work putting the finishing touches to Heroes of BattleLore, the last core supplement we plan (hope?) to introduce this year. By giving you a way to place yourself on the battlefield proper, and letting you gain experience in battle and loot hardly-fought, highly-cherished magical items, we will not only put the last key building block to the BattleLore game system in place, but also open the door to countless future high-in-color adventures! Most records of late Middle-Ages battles focus on a handful of well-known, fairly repetitive and restrictively formatted confrontations such as Crécy, Agincourt, … with interesting skirmishes detailed left to harder-to-read Old French sources such as Enguerrand’s chronicles. Again, the key to reliving fun adventures, be they Medieval or Lore-based, will progressively follow from the introduction of the core supplements outlined above, and greatly benefit from the availability of increasingly varied Specialist units. Think back to the year D&D or Warhammer was first introduced. Neither had the hugely well-developed universe and background stories that now seem synonymous with them. But persistence, and the support of a thriving players’ and resellers’ community, paved the way for the big successes they eventually became. While we may be silent at times, we will continue to work tirelessly toward a same goal. If you want to participate or lend a hand, look forward to the various online tools we will progressively unveil. Otherwise, sit back, relax, and enjoy – the best is yet to come! Next blog entry: The Sounds of Music! and finding the bandwidth required to post new entries. When forced to choose between finishing up products or making new entries, polishing up the products for release will usually win. This being said, we’ve now made sufficient progress on a number of fronts to provide everyone with a long overdue update. The Call to Arms expansion is now inside containers on their way to our respective US and European warehouses. We expect it to reach our shores by month’s end, and to be available in stores in early May, a couple of weeks later than we had originally hoped. The game will be available for pre-orders on our web store next week. MSRP will be $20 in the US, €15 in Europe. 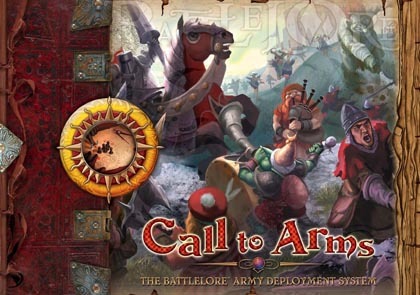 Call to Arms rulebook – now available for download! We think you will find it worth the wait. A few lucky souls got a preview of it at Alan Moon’s Gathering of Friends last week, courtesy of a few airshipped copies now in our possession. To help you remain patient for its arrival, we have posted the rules online. Click here to download them. 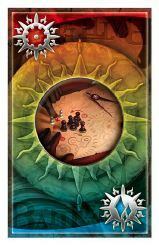 The next expansion in line for release is the expanded deluxe, printed-version of Epic BattleLore. This expansion should reach stores around the end of May, and will retail for $15 in the US, and €15 in Europe. It will be available for pre-order on our web store at the same time as Call to Arms, sometime next week. 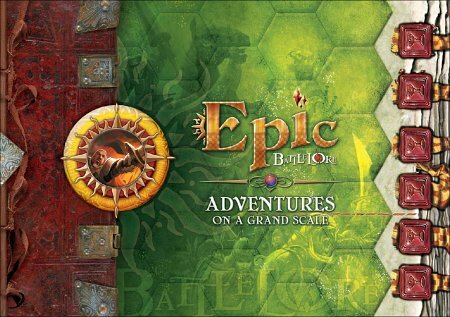 Epic BattleLore – Deluxe printed version coming soon! 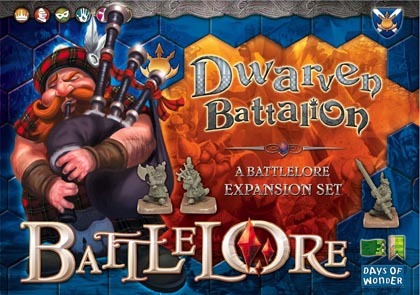 Next in line, just in time for an Origins release (late June/early July), will be our first two Specialist packs: a Dwarven Battalion and a Goblin Skirmishers set. These packs introduce new units to the game, along with the Specialist and Weapon summary cards necessary to field them. For now, let’s just say that they will significantly alter your game. Here’s a sneak peek at one of the pack’s cover. Each of these packs will retail for $24 in the US and €20 in Europe. There is more there than meets the eye (the Epic Command rack really changes things out, despite its apparent simplicity), and more to follow when the paper version comes out, in later Q2 2007. Five new adventures, labeled Epic 1 through 5, have also been posted in the Adventures section.